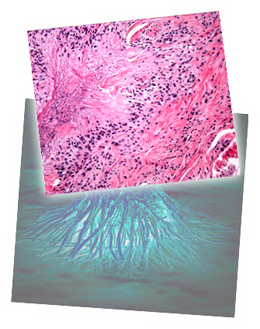 Dermatopathology is a subspecialty of both dermatology and surgical pathology that focuses on the study of cutaneous diseases at a microscopic level. It also encompasses analysis of the potential causes of skin diseases at a cellular level. Dermatologists are able to recognize most skin diseases based on their appearances, anatomic distributions, and behavior. Sometimes, those criteria do not allow a conclusive diagnosis to be made and a skin biopsy needs to be taken and examined under the microscope by a dermatopathologist. Dermatopathologist can reveal the histology of a disease, which results in a specific diagnostic interpretation. In some cases, additional specialized testing needs to be performed on biopsies, including immunofluorescence, immunohistochemistry, electron microscopy, flow cytometry, and molecular-pathologic analysis. More than 1,500 different disorders of the skin exist, including cutaneous eruptions (“rashes”) and neoplasms. SPL’s dermatopathologists maintain a broad base of knowledge, and are familiar with several other specialty areas in Medicine. 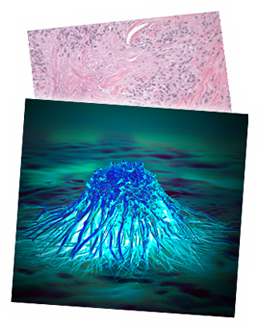 Scanning power view reveals in a rheumatoid nodule a granulomatous tissue reaction pattern (Figure right). Well-formed necrobiotic granulomas form within the dermis frequently with deep extension. SPL can also stain for fungal infections, and mycobacterium should be considered in all significant granulomatous infiltrates. A SPL Dermatopathologist can work in close association with your dermatologists.